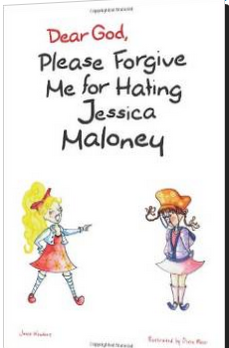 At the beginning of the story, the reader meets the author who is writing a letter to God asking for forgiveness for hating Jessica Maloney. Don’t be mistaken; this book is not preachy or religious in the strict sense of the word. Plot centers around the author, her friend Minty and a boy named Andy who are classmates in a private school. Jessica Maloney is the most popular and prettiest girl in school, but she is far from perfect. She uses her status as the headmaster’s daughter as an advantage to bully other students that she sees as inferior to her. Our narrator is called “Four-Eyed Freak, gets her dress slit, gum placed in her braids, and a book from the library ripped into shreds. Her best friend, Minty, has her pigtails cut, and a friend named Andy, who has hygiene problems, becomes an outcast due to Jessica’s shenanigans. Jessica throws a tantrum in gym class and gets away with it because the teacher is afraid of losing her job. There seems to be no way of fighting back until our narrator concocts a clever plan. She teams up with Minty and Andy to draw “unflattering” posters of Jessica that suddenly appear all over the school. What is on those posters and how will they help teach Jessica a lesson? At the end of the story the narrator explains that all three children feel guilty and apologize to their teacher and even to Jessica. Nice example for children to teach how to deal with bullies without escalating the bullying. This book is targeted to children ages six to nine, which seems appropriate. The illustrator’s beautiful watercolor pictures with pencil details add lots of depth and emotion to the story. Characters are multiracial. Nice book to have handy for parents and teachers to open up a productive discussion on the nature and types of bullying. Available in kindle and paperback formats. Looks like a nice plot. Bullying in private schools is sometimes more difficult to handle as there are additional pressures from within. You are so right, Juie. There have been lots of books on the subject of bullying lately, but I think it is important to note the differences between public and private schools. My niece experienced problems in a private school and the administration failed to get involved due to political and parental pressure. I like books that teach a lesson and this book’s approach to dealing with a bully is wonderful. I like that the children are able to handle the problem on their own, but also learn that what they did wasn’t any better than the bully and they seek to make things right. Sounds like a great story! I like the fact that the victim is transformed into the victor.